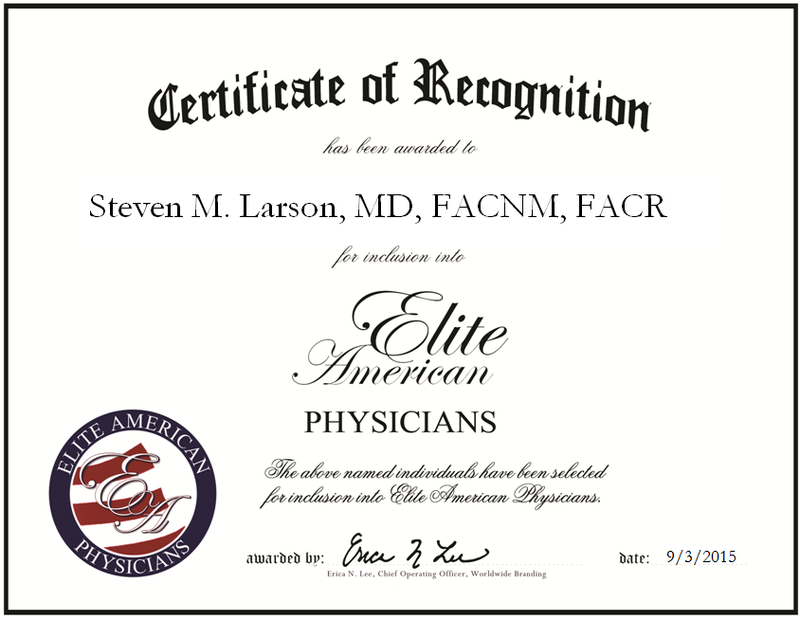 New York, NY, September 3, 2015, Dr. Steven Larson, Chief of Nuclear Medicine Services at Memorial Sloan-Kettering Cancer Center, has been recognized by Elite American Physicians for dedication, achievements and leadership in cancer research. Driven by his unique interest in nuclear medicine, Dr. Larson has been involved with radiopharmaceutical research and development for oncologic applications for more than four decades. Throughout his career, he has served on several government advisory committees and chaired the Radioactive Drug Advisory Committee of the US Food and Drug Administration. He developed a carbon-14 labeled media and sensitive radio detector system to rapidly identify bacterial and cell growth, a technology that is used widely today for detecting mycobacterium tuberculosis. Today, Dr. Larson serves Memorial Sloan-Kettering Cancer Center as the chief of nuclear medicine service, where he continues conducting research and remains heavily involved in teaching, administration and clinical care. Dr. Larson earned an MD from the University of Washington School of Medicine and went on to complete a residency and internship at Virginia Mason Hospital and the National Institutes of Health, respectively. Board certified in nuclear and internal medicines, he stays at the top of his field through his direct involvement with the Department of Radiology and Cornell University Medical College. In recognition of his excellence spanning four decades, Dr. Larson was the recipient of the FDA’s Wylie Medal, the Louise and Lionel Berman Foundation Award and the RSNA Outstanding Researcher Award. Looking ahead, Dr. Larson plans to continue in his research. This entry was posted in Nuclear Medicine, Oncology and tagged cancer research, cancer treatments, molecular imaging, patient care, positron emission tomography (PET), radiotherapy, thyroid cancer. Bookmark the permalink.